There's some kind of aura that comes into play when commanding a new Range Rover. Actually, I take that back. The prestige factor is deafeningly apparent, but it's more than just the name that makes the Range Rover a high end make. You can sense the hundreds of thousands of hours spent defining its visually captivating design, and presumably more in building the advanced technology that compliments it. You can notably feel the confidence slipping off every curve. This is the 2016 Range Rover Evoque. 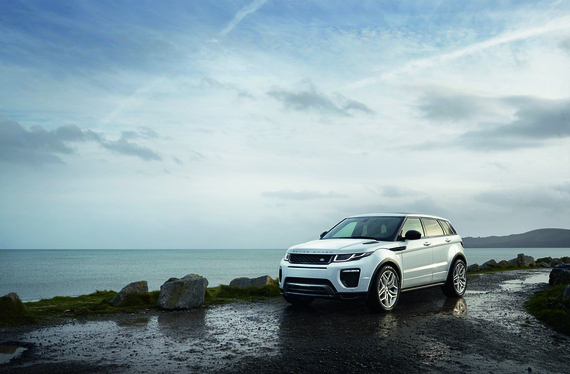 The Range Rover Evoque is the older, more gentlemanly brother of the Land Rover Discovery. It's definitely smaller than the majority of the Land Rover fleet. As a crossover it carries a low profile design than sneaks through traffic with an elegant swiftness to it -- with 2.0L Turbocharged I-4 engine and 240-horsepower under the hood. Starting at $49,990 (CAD), it's in line with the Mercedes GLA, Audi Q3, and BMW X1. 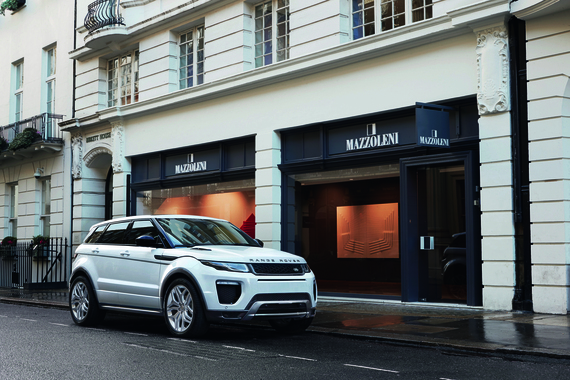 The shortened height of the Evoque is one of the first things that stand out. In comparison to the Land Rover LR4 that towers over it, both cars share a similar price point (when fully loaded). It's a matter of preference for the most part -- some people like taking up as much road space as possible, while others like to keep it low-profile. The 2016 model of the Evoque sports a hefty collection of upgrades, including a beautiful reshaped front bumper, two new grille designs, and all LED headlamps. The test vehicle I received was in Santorini Black and was secured on 18" alloy silver style wheels. I personally would have preferred the white model, mainly because the contrast between bottom-white and top-black is a total eye catcher. Inside the Evoque is another experience all together. The 2016 Evoque features new seats and enhanced door casings, made with premium soft-touch materials. It's soft enough to maybe even cushion you a bit in the event of an accident (but don't quote me on that). The new Evoque also has three new interior colour choices, Lunar Ice, Vintage Tan and Dark Cherry, for a total of 13 to choose from. My test drive came equipped with the Ebony/Ebony Grand Leather Pack and, like all the other colour options, are contrasted with a brushed metal finish. Because of a slight schedule error, I was able to briefly test out two optional features in a fully loaded Evoque. A surprise option is the massage chairs, which really is the icing on the cake in terms of today's luxury offerings. The other optional feature is the maximum speed limit notification. Using the GPS, the Range Rover Evoque is able to show the speed limit for the streets you're currently driving on. It is displayed both in the dashboard and in the holographic windshield display. The technology in the Evoque is noticeably helpful in improving the driving experience. I picked out a few notables to dive into. In the centre console is an 8" Touch Screen with Built-in Infotainment System, which has been given an commendable upgrade in the 2016 model for full multimedia and WIFI hotspot support. Downloading the Jaguar InControl app on your Android or iPhone will connect you to their InControl App System, which allows you to download third party apps for use in the car. Ready to listen to your next audio book en route to work? They have an Audiobooks.com app. Or stream new music from Stitch. It's really integrated if you're the techie type like me. The All-Terrain Progress Control stands out for those that regularly face the treacherous conditions (mud, sand, gravel, you name it). Perfect for cross-country trips and the backroads. As a city driver like myself, not so much -- it's like bragging that your iPhone has a personal assistant named Siri, but never actually using it. One other feature to note -- I have to say that the Meridian Audio System is an audible treat. I've been lucky enough to hear many automotive sound systems, from Bose to Sony to aftermarket. I can confidently say that the Meridian offers a crisp, clear sound that owners will enjoy. Time to start it up. Placing your hands on the door handle activates the remote keyless entry system, which automatically unlocks and shines a Land Rover spotlight below you. Climbing inside and pressing the start button reveals the unique gear wheel, powering on the super bright LED headlamps. It is said that the 2016 Evoque is 18% more efficient than the top selling Land Rover model. Money saved? I'm in. The engine is powerful and fast, taking you from zero to 100 km/h in 7.6 seconds with a top speed of 217 km/h. The handling is what you would normally expect from Land Rover, and with the lower size difference you shouldn't have any problems taking corners and changing lanes. It does drive small when you're zipping through traffic, which is a plus when put beside its larger bodied counter parts. It looks bold, it feels bold, but it doesn't drive bold. The 2016 Range Rover Evoque is in a unique position -- it's smaller than many other compact SUVs, offering enhanced mobility and a beautiful design, at the sacrifice of rear visibility and potential trunk space issues. The finish, both inside and out, are on par with what you'd expect from the luxury aspect, and Land Rover fans can rejoice over the new 2016 style upgrades. Beyond that, upgrades to the driving experience are sparse aside from the new diesel engine. As with most things with Land Rover: if it ain't broke.. well, you know the rest. This post originally appeared on RAMONE.ca.